On a recent trip to Barcelona I discovered culinary nirvana in the very hip el Born district. After a full morning of Gaudi, my boyfriend and I slipped into Comerç 24 for a quick bite and were so impressed we had to come back for the full tasting menu several nights later. Comerç 24 is the genius of chef Carles Abellan. After being introduced to Ferrán Adrià, Abellan did a six year stint at Adrià’s famous restaurant, El Bulli, and learned much from the master of applying scientific techniques and tools to cooking (often called molecular gastronomy). Adrià is perhaps most known for inventing “foams” –a technique which consists of aerating ingredients with a siphon, thereby introducing minute bubbles which alter the texture of food. Following his time at El Bulli, Abellan was selected by Adrià to manage his experimental Talaia Restaurant in the Olympic Port in Barcelona. Abellan then worked in Seville before deciding to open his own restaurant in 2001 on the carrer Comerç. Design of interior space and food unite inside Comerç 24. The interior is a mixture of shiny colored glass, natural stone, upholstered walls and buttery leather chairs. It is modern and sophisticated but also playful…just like the food. The cuisine is a melange of tastes influenced by Asia, Andalusia, Italy, Catalonia and America. The result is as pleasing to the eye as to the palate. On our second visit to the restaurant we arrived at the beginning of dinner service at 8:30 pm (no self-respecting local would be seen eating dinner before 11 pm) because it was our last night and we had no reservation. We had the place to ourselves for about 5 minutes before it started filling up, so I was glad we had arrived early (yes, my paranoia was rewarded for once). 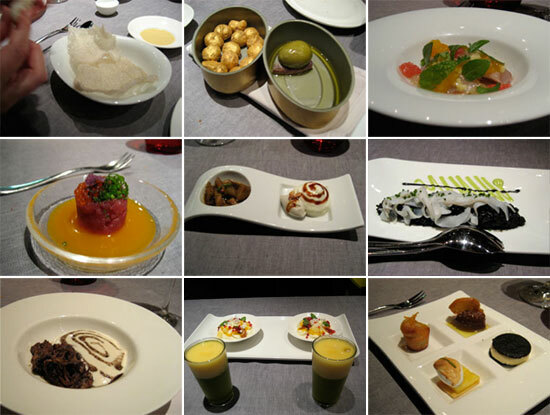 For 54 euros each, we opted for the tasting menu, leaving selection to the chef. We also asked our server to recommend wine pairings to complement the food. It was an incredible experience… which we documented. I was slightly mortified at the idea of being labeled a “tourist” when we pulled out the camera and tried to hide it under the napkin, but then noticed the other diners on either side at the bar were doing the same thing. This was clearly a mecca for foodies and chefs. tasting menu including mackerel with citrus, tuna with egg yolk vinigrette, cuttlefish with squid ink rice, and oxtail with foam. The bar was located right next to the tiny open kitchen, so we were able to see food being prepared. It was amazing to see the chef leaning over the plate and carefully arranging tiny leaves. We tried things we had never had before including oxtail, cutterfish and chocolate sorbet with olive oil and salt (who would have thought?) and left overwhelmed by technique, taste and presentation. The service was wonderful… patiently explaining what we were eating. It is an experience I will not soon forget. 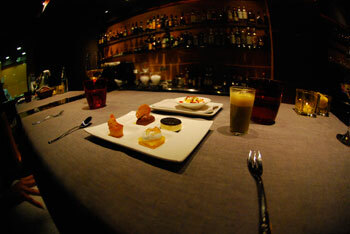 If you find yourself in Barcelona, I also highly recommond Abellan’s newest venture in town.. the more casual Tapaç 24. No reservations are taken and the restaurant is open from 8am to midnight. The menu is printed on a paper bag and the food is more traditional featuring such favorites Pan con Tomate (tomato bread), gazpacho, and tostado de jamon y queso (a mini grilled ham and cheese also know as a “bikini”) This bikini was pure heaven… filled with mozarella, jamon Jabugo (cured Spanish ham) and grated black truffled. Wow. Talk about comfort food. This single meal made my trip to Barcelona… which is saying a lot… but more on that later!